It has been a day of finishing. Finishing wrapping presents, stuffing holiday photo essays into envelopes, making a roadtrip into the Madison Post Office with (thankfully) extended hours to send parcels to far-living family and friends. So all that's left are the parties and the present opening and the food, yes, the food. You know I feel good. The to-do list is empty for the evening and that is a rare event. It has been foggy the past two days, and as Vicki posted today, the snow and ice have been melting. The temperature was in the upper 30's today. I chopped and shoveled ice for a little while this afternoon to clear part of the driveway. This warmth won't last long. The weather forecast has been changing during the course of the day. The last time I checked we were due to get 4 to 7 inches of snow this evening after some rain and the temperature will really be dropping. We're planning to go to a family party in Milwaukee tomorrow. I hope the roads are okay for driving, I would really like to go to the party. 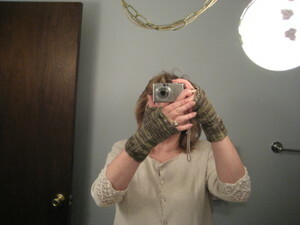 Speaking of finishing, I finished the Koigu Fingerless Mitts on Thursday during the drive to Milwaukee. I even wove in the ends after cutting them (the ends) with my Swiss Army knife. My dad gave me that knife and I use it all the time---well, whenever I haven't had to go through airport security, that is. Here's the standard bathroom mirror shot. ( I did try a few other photos but the focus wasn't on the mitts.) Kim sent me the yarn and pattern to make the mitts. 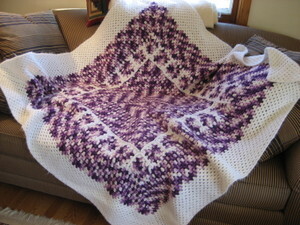 I love the yarn and the pattern is very clear. The mitts turned out great! One of my favorite finished objects. I love them. Thanks, Kim!! This is the reverse side. ...daylily. The first one of the summer for my garden. I really don't know if this is anything other than a regular old roadside variety daylily but it is pretty no matter what the correct botanical name. 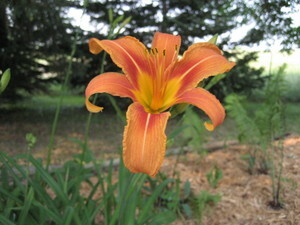 I divided a huge clump of daylilies last fall in an attempt at economical landscape design. 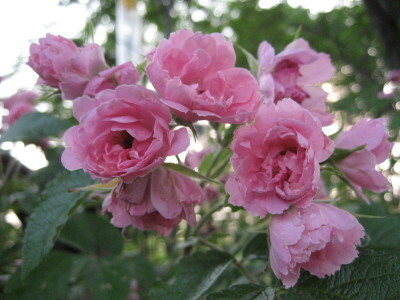 This bloom is only the first of what looks to be many from the divided and repositioned plants. 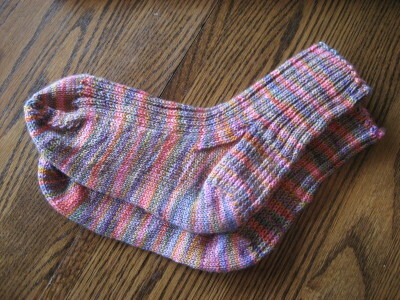 Here are the *finished* Sunrise Socks.....finally. The wait was worthwhile since I did my first rip-back and re-knit successfully. The yarn is Koigu KPPPM, dye code P14772 (two skeins with left overs). I used bamboo dpns in size 2.75 mm. I started these earlier this year but they often sat on the sidelines, patiently. Lessons learned? In the future, choose a pattern with a stated gauge, even if you are using the same yarn. These will be comfortable socks if not very snug, which I believe is partially due to the sproingy-ness of Koigu. 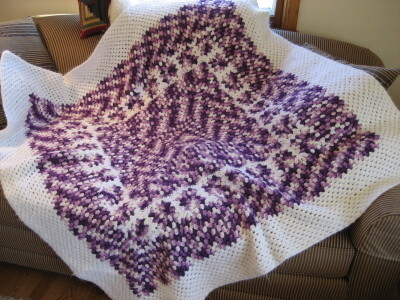 The pattern started with a 72 stitch cast-on. For future reference, my gauge with this yarn and needles is 8 stitches per inch over stockinette. I feel as if I've finally caught my breath today. I was able to run into Madison for errands as well as find a birthday present for my soon-to-be two-year-old nephew. We don't get to see him (or any of the nephews and neice) enough. Yes, the lack of seeing is partially our (mine and DH's) fault for not making time. What's the phrase?....time waits for no aunt or uncle? However, we will see three out of five curtain-climbers next weekend and partake of birthday cake, too. In the meantime, I'll be back in Lincoln, NE, this week. Lincoln is pretty nice. It is big enough to offer a nice selection of hotels, shopping, and restaurants but small enough to be a low-stress place to get around. The people I've met are all very nice and seem to exhibit a Midwest sensibility that makes me quite comfortable. Snow-wise, we probably have about 7 inches of new snow as we were over-achievers and shot past the forecaster's 3 to 5 inch prediction. Now this is Winter! I finished a red scarf this afternoon for the Red Scarf Project 2007 project. I printed out the nifty corset for the scarf and it is ready to head out in the mail tomorrow. I did laundry, finished and wrapped the scarf, nursed a plugged ear, watched the Saints-Bear game (too bad for the Saints), and enjoyed the snowy day. Blue enjoyed the day, too. 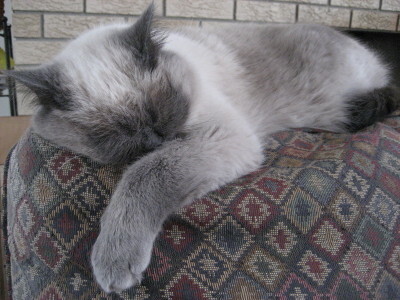 This guy really knows how to relax.